MONTEBELLO >> Cantwell-Sacred Heart of Mary and Citrus Hill high schools have never won a CIF Southern Section baseball title. CSHM is now in position to end that trend. Citrus Hill will have to wait for another season. Daniel Ordonez hit a home run and drove in four runs and the host Cardinals advanced to the CIF-SS finals for the first time with a 4-1 victory over the Hawks on Tuesday in a Division 5 semifinal game. CSHM improved to 27-4 and will face top seed Woodcrest Christian, a 2-1 winner over Tahquitz, for the division title Saturday night at UC Riverside. Adrian Benitez had three hits for Citrus Hill, which finished 22-7. The junior, who began the day hitting .273, gave CSHM a 3-1 lead in the third inning when he dropped fly-ball double between right and center field to clear the bases. He then pushed the advantage to 4-1 with an inside-the-park homer to right-center field in the fifth. The Cardinals then used three pitchers to hold the lead to advance. Chris Ibarra, Andre Garcia and Zachary Thomas combined on a seven-hitter and three strikeouts, but there were some anxious moments. The Hawks put four runners on during the last two innings, but couldn’t get the big hit when they needed it. Garcia, who replaced Ibarra to begin the sixth, got in trouble after giving up a double by Benitez to put runners on second and third with no outs. But Garcia closed the door by striking out Jonathan Ho and Derry Williams before inducing Armando Gurrola to ground out. Citrus Hill threatened in the seventh when the first two batters reached on a single by pinch-hitter Rene Quezada and a hit-by-pitch to Oscar Mancillas. Enter Thomas, who retired the next three batters to send the Cardinals to their first final. CSHM coach Larry Patino: “It’s amazing what we’ve done here in three years. People questioned me why I would take this job. But we’ve won two league championships and been to the playoffs all three years and now (we’re) going to the CIF championship (game) with a bunch of kids that absolutely love the game of baseball. Representing Cantwell with these kids has been a dream come true for me. “The funny part is our banquet was set up for this Saturday night. I (asked) my kids, ‘Do you want a banquet or playing for a CIF title? 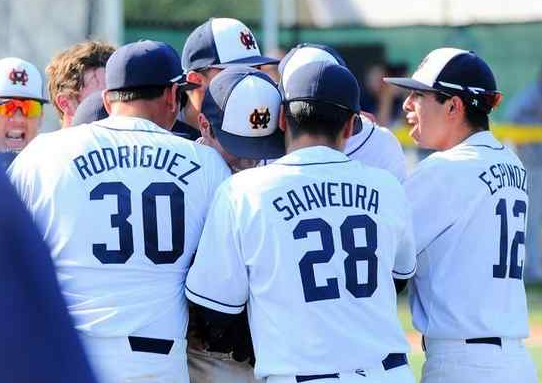 MONTEBELLO >> Kaiser High School baseball coach Michael Spinuzzi knew he was working with a special group of players when the seniors on his team decided to forego grad night ceremonies in order to stay sharp for a playoff game. Kaiser improved to 27-3 and will play Laguna Beach in Saturday’s championship at San Manuel Stadium. Montebello, which had advanced the furthest of any team in school history since 1952, finished 21-12. The Cats have seemingly been swimming upstream since losing ace Nathan Geissler just a month into the season, but you’d hardly ever know it by looking at the results. Jonathan Gonzalez has filled in admirably and did so again on Tuesday. Gonzalez gave up only an unearned run on five hits and a walk. He struck out only one, but the defense behind him was flawless. Run support was absolutely not an issue. Kaiser jumped on Montebello starter Christian Beltran, literally, in the first inning. Leadoff hitter Oscar Rocha sent a shot that hit the Oilers ace in the ankle for a painful beginning. Kaiser scored three times in the first inning. Montebello coach Manny Arana somewhat agreed. The game reached blowout proportions in the top of the fourth when Kaiser added five more runs to what was a 4-0 lead. Justin Wells, who went 4 for 4, picked up one of his five RBIs with a single. Rocha also had an RBI double. Both Rocha and No. 2 hitter Jason Lopez went 2 for 3. Rocha also scored three runs and Lopez scored twice. MORENO VALLEY – Martha Epenesa called it the least she could do. For her Moreno Valley Valley View teammates, it was the most they could have asked for. Epenesa delivered a tie-breaking triple in the bottom of the sixth inning Tuesday to lift the Eagles over top-seeded La Habra, 3-2, in a Division 2 semifinal. Reaching the championship game for the first time since 1999, the Eagles will face Mission Viejo on Friday or Saturday. Valley View (27-1) extended its winning streak to 25 games and snapped La Habra’s at 26. Epenesa’s decisive hit came a half-inning after La Habra (29-2) had completed a comeback from an early 2-0 hole.